And in crying doom, despair, agony, I reference not only the outcome of Arsenal’s Champions League game against Dinamo Zagreb, a 2-1 loss in which Olivier Giroud was sent off with a red card after 39 minutes (and therefore will be unavailable for the next game as well). I refer also to the state of Champions League television rights in the U.S. Here, broadcasting rights are owned by Fox. If you wanted to watch Barcelona v. Roma, airing on Fox Sports I, you could walk into any sports bar in downtown Chicago–and there are at least four such bars within a few blocks of my office. 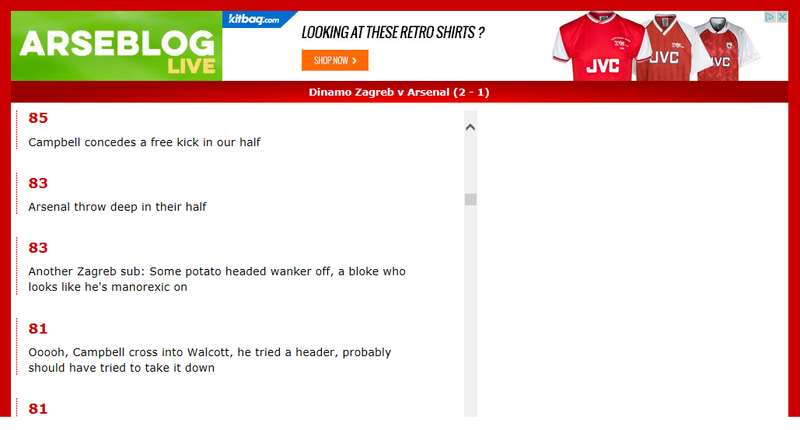 But Dinamo Zagreb v. Arsenal was relegated to Fox Sports 2 (or ESPN 3 for Spanish language). Only the most focused of soccer bars has it, and none are very close to my office. When you are planning to secretly ditch work for two hours during a week when a full international contingent of your company is in town to work through a special project, it’s very difficult to add an extra 45 minutes of transit to the plan. I tried valiantly to find a bar nearby that had access to Fox Sports 2 or ESPN 3, but ultimately had to admit defeat. Fox also has an app, Fox 2 Go, where you can get many games that aren’t on Fox 1. I tried to use it once in 2012 but it froze up so much that in a game in which Arsenal scored 4 first half goals against Southampton, I missed every single goal. I had subscribed to the app for less than one hour before I cancelled it, but Fox still charged me a full month’s subscription for use. Ergo, I just can’t make myself subscribe ever again, even though it’s probably much improved. Yesterday, I had to “watch” the match via Arseblog live blog from my desk at work to get my fix, exchanging IMs with a like-minded colleague who was paying attention to the game by audiocast. I’m confident the game would have had a different outcome if I had been able to see it on TV, and so I feel that I have joint responsibility with Fox Sports for letting the team down. And the entire Arsenal fan base. It might have helped if the lads had pulled their heads out as well. By all accounts, they had a stinker of a game except for the last 15 minutes. But back to the Fox Sports problem, how does UEFA profit from the Champions League, except by selling TV rights to networks who have the ability to extract fees for advertising? I ask because I don’t know, but it’s hard for me to envision how money is made if the network can’t get the game in front of anyone but hundreds of diehard fans all watching a few TVs in a few crowded bars in a giant city. To make sure I share blame a bit further, why doesn’t xfinity carry Fox 2, in addition to Fox 1, in its Sports package? Fox used to have rights for Premier League football in the U.S., and I thank my lucky stars that NBC picked it up two years ago. It’s amazing to be able to count on having access to every game and not have to look all over town for a rare screen with the game I want–no, the game I need–on it. Even when my viewing the match doesn’t produce a win, the way it should. My viewing needs to produce a win this weekend. Arsenal play despicable Chelsea at Stamford Bridge on Saturday on NBC Sports at 7:45 a.m. Chelsea managed to put together a big win this week in the Champions League. Here’s hoping that it’s not enough to kickstart them in the Premier League, and that Arsenal’s loss in the Champions League is just the kick in the arse required.